The U.S. Department of Energy (DOE) is funding research projects that target the increase of efficiency of car engine. The Sankey diagram shown in this post on the Green Car Congress blog visualizes that only 25% (green arrow) of the energy from combustion is used as “effective power” for mobility and accessories, while 40% of the energy is lost in exhaust gas. Projects are being carried out at John Deere, Caterpillar, Detroit Diesel and Mack Trucks, to name just a few. The inefficient energy use of car engines and other vehicles are the main reason for the transport sector being (next to energy generation and transmission) the sector where most energy is being lost (see this post). 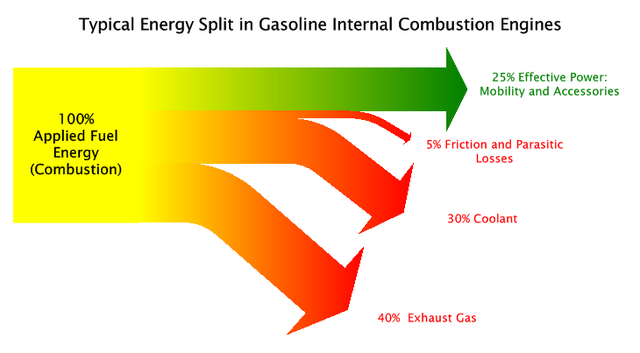 Indeed, waste heat from the exhaust and from EGR system of combustion engines offer a huge potential for fuel economy. heat2power, a powertrain innovation company based in Paris, France is working on concepts to convert waste heat into usable power. Clients are automotive and truck OEMs, powergeneration, marine, and automotive racing. For racing applications the interest is having more power while respecting the regulations. The technology is however the same as that for fuel efficiency. Visit http://www.heat2power.net for more information. The proportions in your energy diagram come as no surprise with the exception of “Friction and Parasitic losses”. 5% is a very conservative figure to which I cannot agree. What study supports this figure ? Functionally, friction can be greatly be reduced as well as the heat caused by friction. Great advances in lubrication that reduce not only friction, but wear as well.